Ronald Baker Quintet, 5ème Jazz And Blues Festival: The Cool Jazz Septet, Philippe Lejeune Trio, Ronald Baker Quintet guest Daniel Huck, Medoc Paradeurs, The Flyin’Saucers, Doo The Doo, Magic Slim and The Teardrops Frédéric Couderc Quartet, 8ème Chicago Blues Festival: Lil Ed Williams and the Blues Imperials, Deitra Farr, Larry Skoller Band. 29 mars : Rolf Lott “New Chump Change” 17-22 au 31 mai: 13ème Jazz And Blues Festival: Malted Milk,Jazz Chamber Orchestra, Les Gosses de la Rue, The Soul Travelers, Cadijo, Rosebud Blue Sauce, Ernie Johnson and Ronald Baker Big Up Blues Band, Philippe Duchemin trio, Elisabeth Kontomanou & Laurent Courthaliac. 22 novembre 16ème Chicago Blues Festival: Sam Tchang &The Texas Sluts, Shakura S’Aida, Andrew Jr Boy Jones, D.C Bellamy, Ken Saydac, Russell Jackson, Willie Hayes. 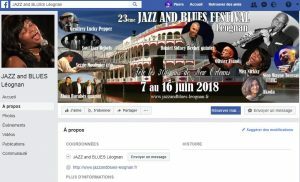 Du 7 au 16 juin; 23ème Jazz And Blues Festival: Soul Jazz Rebels, Geoffrey Lucky Pepper Only, Akoda, Alain Barrabès Quartet, Daniel Sidney Bechet, Olivier Franck quintet, Serge Moulinier trio, Nico Wayne Toussaint big band, Miss Nickky and the Memphis Soul Connection. Le 23 novembre; 26ème Nuit du Blues: Rag Mama Rag, Chicago Blues Festival, Mike Wheeler, Omar Coleman, Peaches Staten.